How do you make soap from goat's milk? Lately, more and more people are interested in a homemade soap from goat's milk. Not only is this beneficial dairy product recommended as a food, but it can be used as a medicine and for cosmetic purposes. Moreover, the popularity of home-produced soap is lately on the rise, especially since they are excellent for skin and hair. Many who suffer from dermatological problems are increasingly turning to alternative solutions. Goat milk is a great solution, and that it was even used by the Egyptian queen Cleopatra, which thanks to it was known for her seductive beauty. It is rich in vitamins and minerals that have a beneficial effect on the whole body. If you want to learn how to make a homemade soap from goat's milk, and how it can be beneficial to your health, this is the right place. Below, we will introduce you to this phenomenal domestic product. To begin with, we will tell you how to make goat’s milk soap at your home. First of all, the making of this product is lasts for 24 hours and for a complete finished product you need thirty days. For preparation you need, first of all, the necessary protective gloves for the hands because some chemicals (sodium hydroxide) must not come into direct contact with skin. In addition, it is desirable to have the glasses on for your eyes to avoid irritation. First, it is necessary to put the gloves on. Then, in a plastic container pour the sodium hydroxide and over it, add distilled water. In another large bowl pour the cold water and add the water in which you dissolved NaOH. This is especially important, because during this time heat starts to develop. It is important to avoid fumes that are released during this process. Once you have dissolved sodium hydroxide, allow it to stand in the pot with cold water to cool down. During this time, take your palm and coconut oil and mix them in a separate bowl. To the cold solution of NaOH add frozen goat milk. It is necessary to mix it until the two ingredients unite, this can take a little longer. Then add palm and coconut oil, along with olive oil. Now it is advisable to combine all the ingredients with the aid of a beam mixer. Good density will be achieve when the mixture starts to look like a pudding. Then add castor oil. Continue to mix with the help of a mixer. Pour 30 ml of essential oil, which could be of your choice. We recommend lavender, because it has a very nice and pleasant smell. When you have mixed all the ingredients, take a mould for making soap. Pour the mixture into it and wrap it into cellophane or aluminium foil. This is important to avoid contact with air. Allow the mould to stand for the next 24 hours in order for a homemade soap to tighten. The next day, pour the obtained product from the mould and cut it into pieces. Then remove them to a special place, to stand 30 to 45 days to mature, after which they are ready for use. Pour water into a saucepan, warm it and over it put other metal saucepan. It is very important to prepare the mixture, cooking it on a steam. In a separate saucepan cook goat's milk until it boils. In a plastic bowl, grate baby soap into small pieces. When the water starts to boil, reduce the heat to a minimum and pour it in a saucepan with the milk and add a teaspoon of glycerine to begin its melting. It may take about 20 minutes, it is necessary to keep the lid on for that time. After that, add the almond oil with a teaspoon of honey and mix with a blender about half a minute. Wait until you get a foamy mixture. Lubricate moulds with a little almond oil and pour the contents into it. Do this quickly, as the soap made from goat's milk will began to tighten. Place the mould in the fridge and leave exactly 24 hours. After that, remove it from moulds and cut it into cubes. 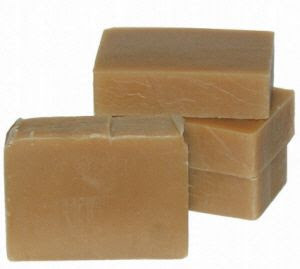 Natural soap from goat milk with honey is necessary to stand for three days to dry. You can use it after that, but it is recommended to leave it to rest for at least two weeks. Probably you have wondered why the soap from goat milk is excellent for skin care. Its main advantage is that it contains lactic acid which helps in removing dead cells resulting in a natural regeneration. In addition, it is full of essential vitamins, nutrients and vitamins A, C and B, as well as protein, zinc and unsaturated fatty acids. Thanks to this combination it stimulates the regeneration of cells, which is why the skin will be softer, brighter and smooth. Another important feature is that goat milk has a pH value identical to that of our skin. Therefore, it has a strong antibacterial effect and protects it from irritation and inflammation. In addition, it is best to use soap from goat's milk for acne, because it is really the best. It deeply cleanses the skin and removes all impurities that have accumulated in the pores. It is recommended for adolescents, because it has a calming effect, and has proved to be excellent and in the fight against acne. In addition to being very beneficial and useful for the skin and face, you can use a natural soap made from goat's milk for your hair. Forget the expensive shampoos that are full of chemicals that can damage your hair so feel free to use this natural product. If you use goat’s milk soap for hair, it will become silky, stronger and will not be prone to decline or even damage. What makes it distinctive is that it does not dry out the scalp and does not produce irritation. Therefore, it is effective when it comes to combat against greasy hair prone to declining. The popularity of goat milk is increasing in recent years. This should not be surprising, considering all the healing properties and benefits to human health that this natural product is offering. In addition to being used to make extraordinary soaps on the market in the last few years, cream made from goat's milk are also present. They are available in major drug stores and cosmetics shops. It is a product based on a complex of goat's milk, which contains vitamins A and E, which helps to achieve a very beneficial effect on your face. It is especially recommended for people who have dry and sensitive skin, and it turned out to be effective in the fight against wrinkles. By maintaining the natural balance cell renewal is achieved and the occurrence of dehydration is prevented. Goat's milk cream for the face has a calming effect, it removes redness and irritation, and what will certainly be interesting is the fact that the skin will be firmer and smoother. It is very easy to apply it, but since it is something denser than the products that you have used for similar purposes, it will take a little more time for your skin to absorb it. Except for using it as a night cream, it is also recommended during the day. Moreover, its use is recommended during winter because during this period the skin is dry and prone to cracking. When it comes to homemade soap from goat's milk user experiences are very positive. More and more people are turning to the natural substances and solutions for efficient removal of numerous medical and cosmetic problems. I use it every morning for hand washing in combination with gel. I got it as a recommendation from a friend who had problems with acne and pimples and it is very helpful. Like hers, my face was literally reborn. It is not greasy and I do not have those annoying blackheads on my nose. I must say that the soap from goat's milk for the face very pleasantly surprised me with its performance. From the use of many cosmetics I had big problems with acne and irritated skin that I concealed with powder. Unfortunately this only made the problem worse, and the pores remained clogged. Only when I bought this fabulous and fragrant product, I realized how much my grandmother was right. For years she told me that these are the best local preparations. My face is now clean, and I do not have problems with acne anymore and red spots and irritation are just an ugly past. I accidentally came across a stall that sells natural and organic products. I saw this little package and the saleswoman gave me a warm recommendation to try it. She told me to be sure to try and replace the shower gel and shampoo with it. Out of curiosity I bought soap from goat's milk and on the same day I tried it. I was impressed by its smell and with it my skin became soft and very pleasant to the touch. I am particularly pleased with the impact it made on my hair, because it removed all the dirt and excess oil. I thought that my hair would become dry, but it just helped me to get the strength and volume. If you are impatient and want to try this phenomenal product, it can be purchased in most health food stores, specialized stores for cosmetics and in herbal pharmacies. With it there is simply no mistakes, everything is up to you and your decision, today it can also be ordered online, virtually with two clicks. If you want to know how much money is necessary to buy the soap, the price is more than affordable and is around 2 dollars per package (75 grams). These are soaps that are made by hand, according to the recipes and therefore are the best and most efficient to use. Today you can purchase soap from goat's milk with marigold and green clay, brewer's yeast, honey - the choices are really great. When buying these products, be sure to pay attention to the composition, it is important to read the declaration. They should be based exclusively on organic goat milk. Generally speaking, only in that way you will be sure that it does not contain traces of additives or any chemicals that can cause adverse effects. Use soap from goat's milk daily, it is a true heritage of tradition. Enjoy this gift of nature and you will be satisfied! If you consider this article good and useful, share it through social networks.